Jacob Aall Bonnevie Bjerknes was a Norwegian-American meteorologist. He developed with his father, Vilhelm Bjerknes, the Norwegian cyclone model, which explains the life cycle of cyclones. November 2, 1897Birth, Stockholm (Sweden). 1920 – 1931Superintendent, Weather Forecasting Office (Norske meteorologiske institutt), Bergen (Norway). 1924Obtained PhD in Meteorology, University of Oslo (Universitetet i Oslo), Oslo (Norway). 1931 – 1940Professor of Meteorology, Geophysical Institute, Bergen Museum (now Universitetet i Bergen, Geofysisk institutt), Bergen (Norway). 1940 – 1975Professor of Meteorology (1940-1965) and Emeritus Professor (1965-1975), University of California, Los Angeles, Los Angeles (Calif.). 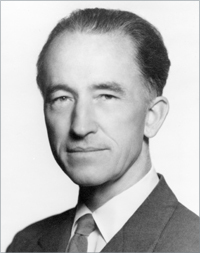 1948 – 1951President, Meteorological Association, International Union of Geodesy and Geophysics. July 7, 1975Death, Los Angeles (Calif.). Professor of Meteorology and Emeritus Professor. Obtained PhD (Meteorology) in 1924. Jacob Aall Bonnevie Bjerknes charts, 1880-1959. In memory of Vilhelm Bjerknes on the 100th aniversary of his birth /published by Det Norske videnskaps-akademi i Oslo in cooperation with the American Meteorological Society, Boston.